We are indebted to Mr. Weston Schmitt, grandson of Barton R. Deming, for graciously providing us with a number of extremely important historical photographs of Euclid Golf. 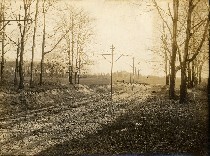 These period photographs are a record of how the area appeared prior to Barton Deming developing it. Moreover, they reveal the extent to which the area was improved by Deming prior to his actually constructing homes. There are also views of Deming’s two charming real estate offices that give us a glimpse of the sales methods utilized in early 20th century real estate development. Mr. Schmitt’s collection also includes a suite of photos of Deming’s own house at the foot of Fairmount. We have included a sampling of these photos showing interiors and views of the extensive gardens. Mr. Schmitt has generously donated the original photographs to the City of Cleveland Heights.